Geek chic specs continue to be all the rage, especially during Hollywood events. Chunky black styles were a popular choice as well as bold, browline frames. The wildest look came from none other than LMFAO front man, Redfoo, who jazzed up his over-the-top outfit with white, oversized frames. On the other hand, teen heartthrob, Justin Bieber, gave everyone “Bieber Fever” by showing off his mature side in black, dapper specs semi-rimmed in gold metal. 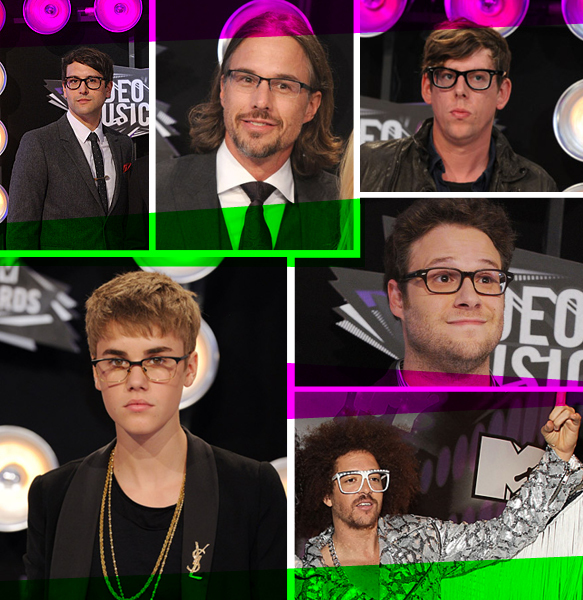 Overall, we have to say these Hollywood hunks made the right choice by throwing on some eye candy. From rockers to rappers to reality TV stars, it seems like no one left home without their red (or in the VMA’s case black) carpet worthy sunnies. Plastic and metal aviators, modified wayfarers and futuristic shields were among the fan favorites. Many artists—including Cobra Starship, Pitbull and Miguel—went with blacked out, gradient or mirrored lenses to add that MTV edgy appeal. Without a doubt, these music moguls understand how to use their shades to make an undeniable fashion statement.